Richie Benaud was the embodiment of Australian sporting culture. A champion of the game of cricket during his paying career and a champion for the game in the commentary box. 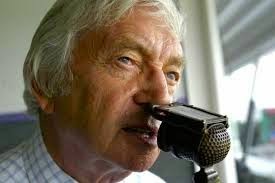 He was respected and loved by everyone from MCC Members, to the last drunken yobbo I the outer, Ritchie Benaud was cricket. I did not see him play but his record shows he changed the game as an aggressive all rounder and extraordinarily successful captain. Leading the on-air commentary of World Series Cricket he told the world about the biggest changes in the history of the sport. It was Benaud’s dulcet tones that brought limited-overs cricket to the world, explaining the rules and nuances of the game to everyone. With perpetual debates about “what is Australian culture?” One simple answer is “Richie Benaud”. Hard working, loves summer, loves sport, fiercely competitive on the field, a great mate off it, with a great sense of humour. Richie has won many awards for his playing and broadcasting around the world. The greatest accolade is that he is known the everywhere as “Richie”. Before PR managers, personal brands, and social media he was known simply as Richie. He was everyone’s mate. To his wife Daphne, I want to thankyou for graciously sharing Richie with the world for more than 60 years.